Pancakes with all of the flavours of pumpkin pie! It’s like having dessert for breakfast! I had a bunch of pumpkin puree leftover that needed to be used and I figured that it was the perfect opportunity to make one of my favourite pumpkin dishes, pumpkin pie pancakes, and to update the photos for the recipe! Pumpkin pie pancakes are one of my favourites because they are so nice and light, fluffy, moist and tender and not only do they taste just like pumpkin pie but they are so quick and easy to make! I mean really, it is as simple as mixing the dry ingredients, mixing the wet ingredients, mixing them together and the cooking the pancakes! 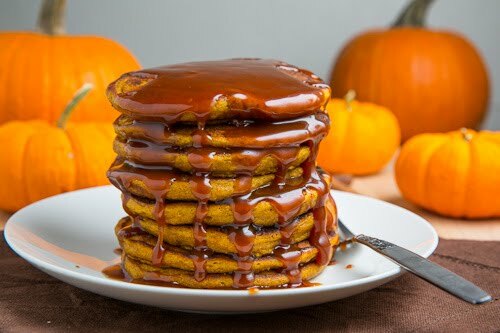 In the past I would normally have served these pumpkin pie pancakes smothered in maple syrup but more recently I have been liking the pumpkin and caramel flavour combo and since homemade caramel sauce is so easy to make that is the way that I went this time. One of the nice things about caramel sauce is that when it is cool it is nice and thick but if you warm it up a bit it becomes much more fluid, like a syrup, which is perfect for pancakes! Oh, my! Pumpkin pie pancakes smothered in caramel sauce; it’s just like having dessert for breakfast! If you want to be a bit more decadent you could use a vanilla bourbon caramel sauce ! Just look at all of that sweet, sweet caramel sauce dripping down the sides! Mix the flour, baking powder, baking soda, cinnamon, nutmeg, ginger and cloves in a large bowl. Mix the egg, milk, pumpkin puree, butter and brown sugar in another bowl. Heat a pan over medium heat and melt a touch of butter in it. Pour 1/4 to 1/3 cup of the mixture into the pan and cook until the surface starts to bubble and the bottom is golden brown, about 2-3 minutes, flip the pancake and cook the other side until the bottom is golden brown, about 1-2 minutes. Okay – now time to comment. You know – you never cease to amaze me. Your creativity is astounding. Nice job on those pancakes! Great flavors for this time of year. Looks like a perfect use of the leftover pumpkin puree I have sitting in my fridge! YUM! So spicy and yummy! A gorgeous treat! Delicious, Kevin! I made some pumpkin waffles last year but never pancakes. I am bookmarking this one. I love pumpkin! These pancakes sound like something I could sink my fork into! They look delicious (and it’s hard to make pancakes *look* delicious when shooting them)! Wow… these look amazing! I have some leftover sweet potatoes in my fridge, I wonder if I mash them up if they would work…hmmm, I think I’ll have to give it a try! Great take on pancakes and the spices and pecans are a nice touch. Hey Kevin — we must be on the same wavelength. I recently did a post on pumpkin pancakes as well, but my version was gluten-free. I’ve never been here before and I love your blog! We’re on the same wavelength with the chard as well. I throw raisins in everything including sauteed greens (cabbage too). I’ll be back to visit again soon. Great photos, too. OMG Kevin, these look awesome! I just made these too, I have yet to post them though. Weren’t they good? The buttermilk made them come together so nicely. I’m booking my table for next sunday morning! Welcome to Fall!! These look wonderful!!! Reminds me of what I do when I make pumpkin pie: there is too much pie filling in one recipe for the pie shells I use (still haven’t tried making shells from scratch) so I take the leftover filling, soak some bread in it, and make pumpkin-pie-French-toast. 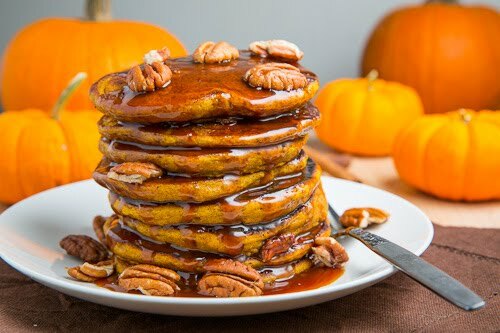 Pumpkin pancakes are my favorite new thing this fall! So delicious! 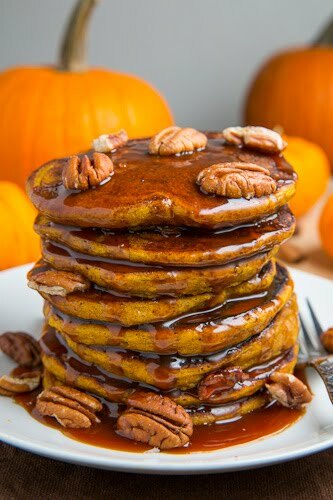 I love a good batch of pumpkin pancakes, and these look delicious. Great use for those little bits of canned pumpkin that we all end up with at one point or another too! Just got up, and saw your pancakes look absolutely mouth watering. Imagine having this right now, I am sure my whole house will smell so good with all of those fragrant spices. Delicious! Pumpkin pancakes are my favorites! My kids request them each year for their birthday breakfast. Your recipe looks delicious. Yum, these look so good. Maybe I can convince my boyfriend to get off his diet for a day so I can make these for him! I love pumpkin and these look fantastic! i love anything pumpkin! those pancakes look tasty! Pumpkin Pie Pancakes? *faints* I heart you for this, Kevin. I really do. yum! i’d say these are pretty much the perfect lazy sunday breakfast. We are breakfast fiends, this is on my list to try! Those are the kind of pancakes that I would completely finish and then want to lick the plate…is that rude? I love how you cut a “pie wedge” in the photo! Looks like a great recipe – I have two cans of pumkin to use up too! Also, I tagged you, don’t feel obligated though! These look and sound fantastic, I love them! All I need to hear is “pumpkin pie” and I’m in line! Don’t you just love pumpkins at this time of year? these sound excellent. i think i’ll be whipping some up for brunch this weekend! Be still my beating heart………. and pass me one of those pancakes Kevin, won’t you? I made pancakes this past weekend too. I’m loving the sounds of these. Very creative as usual. I really love making homemade pumpkin pancakes, seeing yours upsets me in the fact that I have not made any this year. I will have to remedy that right away. yum! these look tasty – and i love the toasted pecans. it sounds delicious!! Will you and your awesomeness never cease? I have a jar of pumkpin puree sitting in my fridge! But my husband doesn’t like pancakes though yours look really fantastic! This looks amazing! I now know what we are having for breakfast tomorrow. Mmm! That sounds delish – I would have needed a pat of salted butter to complete the experience. Omigod. I really have to make these! What a great combination of flavours…yum! How fabulous are these, the perfect breakfast anyday! Oh I’m so hungry for these, they look fantastic Kev! boy! you are one sinful chef Kevin!! those pancakes look delish!! I’d love it if you could send them in for my vegetarian thanksgiving recipe event! they would be a perfect addition! We made these! Delicious! We used whole wheat as instruacted but used barley flour instead of the white flour. The only other change was that we used honey instead of brown sugar. Otherwise we follwed the recipe. Turned out great! We made a double batch and ended up with 16 generous sized pancakes. I attempted something similar, except I used the “Just Add Water” mix. LOL! Sounds like your’s worked out a little better! Wow, I can smell these pancakes cooking! They must taste great! I would like to make these over the wknd – but question. The ingredient list says milk, the directions say buttermilk. Which do I use? kd: I used milk but I am sure that buttermilk would be great as well. Awesome recipe. Used some leftover mashed buttercup squash and it was awesome. Love this blog. I'm craving these so much right now. Absolutely stunning. Thanks for the reminder!! I desperately need to make these AS SOON AS POSSIBLE. These would be a HUGE hit in my house! YUM! Oh, stop it! How could I possible look at this photo and not want to pile a stack of those ridiculously yummy looking pancakes on my plate! These look amazing! Great idea for a fall breakfast! These look incredible! Love the pumpkin and caramel combo! Now that's a stack of pancakes! And you know, I could eat that all! Kevin, these look scrumptious. I'm gonna be making some kind of pumpkin pie pancakes before fall is up… your version looks amazinggggggggg! You're awesome! I have a pumpkin puree leftover from a pumpking pastry I made. Thanks for the great idea! The pancakes look amazing! I am trying these tomorrow morning – I bought 6 pumpkins that were marked down at the grocery store and now I need to use them. Kevin, Do you have plans to join the next Food Network Star? I see a big future for you! Thanks for the great recipe Kevin, can't believe it's taken me this long to get around to making them!! These were so good! Nice and fluffy with great pumpkin flavor.